That she’ll have a long, healthy, happy life…as close to purr-fect as she can get. And trust us when we say we want that for your cat, too! And for good reason: by the time your sweet feline reaches her senior years—typically, around 7 to 11 in human years—it’s all you can do to not swoon over her every day. After all, there’s something so special and sweet about animals in their golden age. Does my older cat have different dietary needs compared to her younger siblings—or even compared to when she herself was younger? The answer is almost definitely yes. In this review, we’re going to talk about the unique nutritional needs of your senior feline, things to consider when choosing the best food for her, what senior cat food is exactly, and which food brands are the best of the best based on price, customer reviews, ingredients, and of course—kitty feedback. What Should I Look for in Senior Cat Food? All cats have a few basic nutritional requirements, and their diet needs to be able to support and meet these needs. This is essential at every stage of life, but especially in her earliest and latest years when her immune system may need some extra help to remain fully functioning (see the next section for dietary requirements of senior kitties specifically). They need to have a lot of protein. Cats evolved as carnivores, and their bodies do best with a diet rich in animal-based protein. In fact, protein should be the bulk of their caloric intake. They need to have healthy fats and plenty of vitamins, minerals, and antioxidants. These nutrients support everything from healthy coat and skin to proper brain and muscle development. They need minimal carbohydrates. Ideally, the carbs they do eat will be low on the glycemic index scale (don’t spike blood sugar a lot) and are nutrient dense—in other words, more fruits and veggies and fewer (if any) potatoes, corn, soy, and grains. They need adequate hydration. Cats don’t have a super strong drive for thirst. This is mostly because they evolved by getting most of their hydration through the moisture-rich meat which they hunted and ate. To make sure everything runs smoothly, make sure your kitty gets plenty of fresh water every day. You can entice her to drink more by using a kitty fountain and keeping her water away from her food. They need the right amount of food. Cats need enough food to support play and exercise, but not too much to promote weight gain and obesity. Kitty obesity is a big problem (no pun intended) that can increase an animal’s risk of diabetes, arthritis, and many other health problems. Keep in mind that, like humans and other animals, kitties do better when they don’t consume artificial preservatives, fillers, and other chemicals which can disrupt normal digestive and gut health. And while higher quality food that’s free from these ingredients costs more than the typical commercial options, it really is worth it when you consider how much healthier it can make your animal over the course of her lifetime. As we’ve seen, all cats do have some basic nutritional needs. But if you’re one of the lucky ones who has a kitty at home enjoying her old age, then you should realize her dietary needs are likely even more specific and nuanced now. Reduced ability to smell and taste: as kitties get older, they may begin to lose interest in food. This is often because they can’t see, smell, or taste quite as well as they used to. You can probably imagine how not being able to experience your food fully will make it less appealing to you! Dental problems: Older cats often have periodontal disease (gum disease), broken, loose, infected, or missing teeth, or simply weaker jaw muscles. Understandably, such problems can make it difficult to chew, especially hard food. Changes in digestion: as felines grow older, it often becomes harder for them to digest fat and absorb nutrients from the food they eat. This can lead to gastrointestinal problems and even malnourishment in extreme cases. Age-related illnesses: Like humans, kitties are susceptible to certain diseases as they get older. This includes things like arthritis, kidney or liver problems, food allergies or intolerances (even to normally healthy ingredients like fish and eggs), and more. Your kitty’s diet should a) help her avoid these age-related illnesses and b) help her manage her symptoms if she does develop one at some point. For example, certain illnesses and diseases require extra fiber or special supplements, including omega-3 fatty acids. But don’t worry: your vet can answer your specific questions. Lower vitamin levels: Stress, age, and illness can deplete an animal’s body of essential vitamins. And again, because older cats often tend to eat less than their younger feline peers, they may be at a greater risk for vitamin deficiencies, including thiamine (aka B1, which is important for breaking down carbohydrates). Dehydration: signs of dehydration in cats are not always obvious. But because older cats tend to eat less and drink less, they are at an increased risk for this potentially dangerous health problem. Changes in metabolism: metabolism tends to slow down for a kitty as she gets older. Plus, your animal may not be as active as she was in her more youthful days. Together, these may increase her risk for weight gain. Because of this, older kitties often don’t need to eat as much as they used to. Smaller portions are key to making sure your older feline doesn’t gain weight. Of course, you know your kitty better than anyone. You may have even raised her since she was just a little kitten! But if you ever have questions or concerns about your pet’s unique dietary needs, it’s always a good idea to chat with your vet. He or she can give you tailored guidance that will help you make the best possible choices when it comes to your cute little furball. More moisture: this is to combat the risk of dehydration, which as we’ve seen is common in older felines who tend to eat less than the young’uns running around. Slightly more fiber: since older cats tend to have difficulties with digestion, getting slightly more fiber in their diet can help them stay regular. Soft wet foods: a cat won’t eat her food no matter how hungry she is if it hurts too much to chew and swallow! Soft wet food is usually ideal for older kitties, simply because it’s easier on their teeth and jaws. Ingredients list: again, because older kitties have a harder time digesting their food, any ingredients that are artificial, known allergens, or otherwise “unhealthy” may be poorly tolerated by older kitties. This may include ingredients like grains, artificial colors, corn, soy, and carrageenan. To optimize her nutrient intake and reduce the risk of gastrointestinal problems, you want to look for ingredients that are real, whole, and natural—readable, in other words. By this point, you hopefully have a better idea of what a solid nutrition plan looks like for your senior kitty. Now’s the time to figure out which brand of senior cat food is best for your animal and easy on your budget. 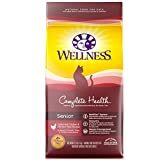 This senior dry cat food from Wellness offers a lot of wonderful real ingredients for a healthy older feline. For instance: cranberries support urinary health, flaxseeds offer healthy fatty acids, rosemary is rich in antioxidants, and real deboned chicken for quality protein. It also has a new smaller kibble size and shape which makes it easier for older animals to eat and enjoy. 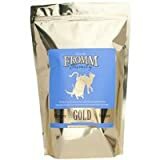 The company Fromm is a well-respected cat food brand, and their food for older kitties is well-received. It’s free of corn and wheat and appears to be enjoyed by even picky kitty eaters! This dry cat food is great for senior cats, especially senior kitties who live indoors all the time. It’s been fortified with essential fatty acids and nutrients like taurine, as well as healthy antioxidants for a strong immune system. Finally, we’re getting into some of the better wet food options for senior kitties. This product by Nature’s Variety comes in an appealing pate style and is made with 95% real cage-free chicken, turkey, and chicken liver. As for the carb sources, they’re mostly the water-rich ones you’d like to eat too, including broccoli, cabbage, kale, parsley, blueberries, and pumpkin. Rounding out our list is another canned cat food for seniors. While among the pricier options from the list, this brand uses high quality single-source protein from ethically raised, free-range animals. It’s also free of the usual oh-no-no’s when it comes to cat food (grains, rice, soy, potatoes, agar agar, BPA, perservatives, fillers, wheat, sugars, etc.). In addition to giving your golden girl top rated senior cat food (in other words, knowing what to feed her), you also should be aware of how much to feed her. Of course, every cat is unique, which means your four-legged darling may need slightly more or less food compared to the “average” recommendation. That said, starting from a general guideline is a good place to start. The typical recommendation for kitty portion control is around 240 calories per day for an average 8-pound cat. But you’ll probably need to decrease this amount slightly as your animal ages, since her activity level will probably go down. Use your best judgment. You should be able to easily feel (yet not see) her ribs when you run your hands down her body. And when looking at her from the side or the top, you should see a clear narrowing at the waist area. Now, most senior cats do best eating one to two times per day. In fact, your kitty will probably be able to keep eating as often as she did when she first became an adult—the portions may just need to be smaller. Keeping a similar feeding routine may actually encourage your older animal to actually eat and drink enough. Remember…kitties are creatures of habit. Change can be hard, especially for an older cat who’s adorably stubborn, a bit picky, and more or less set in her ways. If your cat is used to being free-fed (that is, if you leave out food in a dish so she can eat whenever she wants), you may be able to continue doing this…but remember, hard dry food may not be appropriate for your senior, and wet food shouldn’t be left out all day. So if you do have to make the move away from dry to canned food, you may also have to prepare yourself to change your feeding routine, too. This is especially important for older kitties who probably have more sensitive stomachs to begin with. Start by mixing 25% of your cat’s new food in with 75% of her old food (for a total of 100% of the calories she usually gets). After 3 to 4 days, adjust the ratio to 50/50: half old food, half new food. After 3 to 4 days of this, adjust the ratio again so she’s getting 75% new food and 25% old food. Finally, after 3 to 4 days of 75/25, switch her fully to her new food. Watch her closely to make sure she’s tolerating the switch well, and talk to your vet if you have any concerns of how she’s responding. Your senior kitty may be “mature,” but we know she still has tons of personality! Make sure you’re optimizing her well-being and supporting her health from the inside out with the right type and amount of cat food. That way, she’ll be able to show off her unique personality and enjoy her life with you for as long as possible!